Once past the sweets counter, diners are guided through a spacious interior with dark floors and light wood table tops. A marble countertop lines the enormous kitchen, offering alternative seating with a view of some food preparation. The L-shaped space opens up in the back to an even larger dining area. We slid into a comfortable freestanding booth with a view of J.Crew and soon-to-be H&M. It was no surprise given the restaurant’s infancy that our ever-so-sweet server took a while to articulate the opening spiel. But we learned that Range focusses on traditional dishes with a modern twist, using locally sourced, seasonal ingredients. The menu is divided by category of food and method of cooking, with each section prepared in a different kitchen. 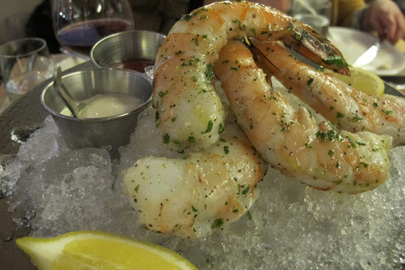 Diners can choose from raw bar items, carved meat and cheese platters, house-made baked goods, cold starters, house-made pastas, wood grilled steaks, wood oven pizzas, pan roasted poultry and fish, and a selection of side dishes. Small to medium-sized plates are meant for sharing and eating family style. With two gluten-freers, one vegetarian, and one picky eater, it took some time to decide on our combination of plates. We started simple with the sampler cheese plate, accompanied by fresh apple and pear compotes and cinnamon-raisin toasts (on the side of course). Before ordering, Souper Girl and I explained our food restriction with a little trepidation considering the potential lack of experience handling our kind. Without too much hesitation the server assured us that much of the menu is gluten-free and what is not can most likely be adjusted, leave it to the chef. (Unfortunately or fortunately a shared fryer does eliminate a handful of the more sinful items.) Despite his assurance, the blue cheese we tried to avoid still showed up on our cheese block. The 3 apologies we received throughout the night from various staff made up for the glitch. What followed was a fleet of dishes delivered at a leisurely pace. First to arrive was the fennel, arugula and parmesan salad, and the kale caesar with whitmore farm egg. The fennel salad was fresh, crunchy and garnished with bright blood oranges three ways: fresh wedges, sweet candied peels, and gooey jelly drops. The kale ceasar was a refreshing take on the classic salad, with shaved kale tossed in a very light custard-like dressing and sprinkled with parmesan. Although some bites were a tad salty for my palette, the bitter kale played well with the creamy sauce and the dish was a hit with us all. Next came the shrimp cocktail, with four of the largest shrimps I have ever seen, perfectly cooked and sprinkled with fresh parsley. Mr. Green Bean’s pick, fall-off-the-bone roasted chicken with lemon, garlic and rosemary, proved that simplicity is bliss. Souper Girl’s choice, the wood grilled Pine Ridge coulotte (a.k.a. 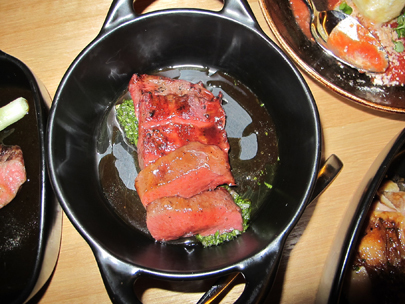 top sirloin), was tender, juicy, and enriched with generous dollops of hazelnut marrow butter. 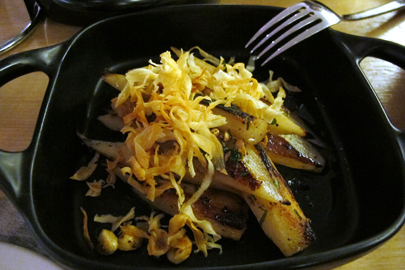 We took a chance on the salsify side dish with hazelnuts, satsuma mandarin and parsley. Salsify, a little known root vegetable, is ugly in it’s natural state and tricky to prepare. Range takes the challenge with a 24 hour cooking process that results in a stunning transformation and uniquely flavored dish. With some persuasion from our server, I asserted my adventurous side and tried the dish that is apparently getting lots of buzz: beef heart served over a light chimichurri sauce. As this was my first beef heart experience, the chewy texture took some getting used to. But the meat was bursting with flavor and the accompanying pureed cilantro and parsley served as a refreshing counterpart. A bit disappointing was Sister Seitan’s options for a vegetarian entree. While the menu offers plenty of vegetarian side dishes and a couple of salads, it is lacking a more substantial grain or vegetable based dish to round out a veg meal. Even all the pasta dishes contain meat, and only the seamless goat cheese ravioli could be altered to meet her needs. However, the raviolis were, in Sister’s words, “plump perfection”. Just when the meal came to a close and we considered rolling ourselves home, three scoops of house-made frozen ice cream and sorbet arrived as a special birthday treat. Suddenly our spoons were up and we made room for the rich salted caramel, tart granny smith apple, and citrusy blood orange. We did succeed in resisting the tempting candy cart presenting fine confections that are available at the table or to go, clever indeed. I left wondering—with the dining space as large as it is, and the menu as vast—the world behind those swinging doors must be quite spectacular. Range is an impressive operation, managing so much activity while making diners feel relaxed and at home. Categories: 4 Spoons, American, Comfort, Dessert, Gluten-Free, Local, Maryland, Seasonal, Small Plates | Permalink. Thanks for the comment. I appreciate the research being done. Somehow it still seems too close for comfort to make the stinky cheese appealing to me again. But it’s great that research is being conducted to alleviate some of the food restrictions for those of us with celiac.